The Fly-Fishing movie with a difference. August: first month of autumn and the “Soldier Palmer”. Dietrich Bohnhorst and a nice August Grilse. In most parts of Europe August is the month of “High Summer”. Temperatures are well up and golden corn fields sway gentle in the summer breeze. In Ireland August is the first month of autumn. Temperatures still pretty high, is August here mostly a wet month, particularly on the west coast. 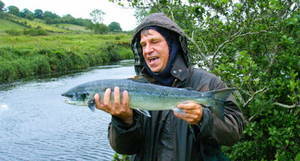 That is what the angler wants and where he wants to be, because rivers are often in spate and the grilse run, normally. Still, most of us think grilse fishing is a summer sport, but really it is an autumn pass time. Well, this harmless merriment or “pass time” is actually an addictive passion. You just have to be out, walk the river, do a few casts here and there, persist concentrated at those pools that look incredibly promising and wonder if something might happen at all. You’ll meet friends and colleagues, have a chat, listen what they have to say, watch what they are doing; if they are successful you do the same, if not, try something else. You have your favorite patterns and methods anyway. Ray Robinson at a Donegal Spate River. During the 80s and 90s Ray Robinson and I used big “Soldier Palmers” to catch salmon in Donegal Spate Rivers. For some unknown reason we just forgot all about that fly, used Masquerades, Shrimp Flies and modified Bibios. In 2013 there was this faint memory becoming more vivid: can you remember the Soldier Palmer? We used to catch a lot of fish on it. So, I tied a few, we tried them again and caught fish straight away. It still works, and why not? Now, when autumn really arrives, in late August that is the time for the Soldier Palmer. 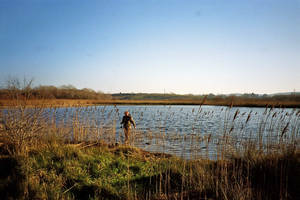 The days get noticeably shorter also a good few of the salmon you catch are coloured and should therefore be returned. Since the Soldier Palmer is generally tied on single hooks it doesn’t do the fish much injury. On the other hand are the “single irons” large enough to land even big fish safely. If you want to fish two flies: combine the Soldier Palmer with a “Black Widow”, also tied on a single hook. And then, it’s a doddle, catching all these salmon on a Soldier Palmer. For the game angler in Ireland October and the closed season come always much too early, because everything seems to be over for yet another year. If you want to take care of your rods and reels, now is the time to clean, oil and grease them; stow everything away in the attic or in the shed. Next spring, when these precious things are needed again, seems an awful long time away. Me as a young man on a Donegal Lake. g) fish for pike and perch. 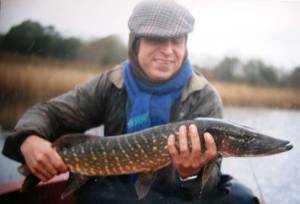 I know that many anglers, particularly in Ireland, are not really fond of pike and pike fishing; to catch these predators can be very exciting and challenging though. Finding the right place should be no problem and no excuse. Unless you live in the very north west of Ireland, you don’t have to travel far to the next pike water. Apart from some coastal regions, pike and perch are very widespread, live in rivers and Loughs of the mighty Shannon – Erne Complex for example, as well as in countless smaller brooks, lakes and ponds. Some live in nutrient poor acid bog lakes, others in rich limestone water. Some grow big and plump in a short time, some find little food and take ages to grow into long, thin monsters. What they all have in common is: October, November and December are the best months to fish for them. At this time of year pike and perch are at their very best. Water lilies, weeds and reeds have mostly died down already, making it easy for the angler to retrieve the lure without hooking “Greenery” every other cast. Artificial lures, like streamers, spoons and spinners in their various shapes, sizes and colours are probably the most effective contraptions to catch pike and perch. Unless you want to use dead bait. By the way, herring and mackerel work a treat. Back to the lures: Effzett spoons, 16 to 30 grams, in silver or silver/gold are, in my opinion, by far the best artificial things to catch pike with. Small spinners for perch: almost everything goes. Silver or copper bodies with reddish or greenish blades work well. They should just be of good quality and turn easily. No matter whether you want to catch pike from a boat or from the banks, your tackle should be strong and sturdy. Lines between 15 and 25 lbs, a rod with fixed spool reel capable of casting spoons up to 40 grams or so is what you want. A big landing net is also essential and long nosed pliers, to get the hook out of the pike’s tooth studded mouth. That brings me to another important gadget for pike fishing: the wire trace. Use it. Even if you are “only” fishing for perch with small spinners. Very often pike in the 4 – 8 lbs class (and sometimes much bigger) take these little lures and chew through most monofilaments without difficulty. For your general perch fishing much finer tackle is used, of course. The fish you are after is mostly palm size or thereabouts and doesn’t require the heavy guns. Not in Ireland anyway. Now, to some people it might seem boring to fish for small fish. But, fried perch fillets are a delicacy (only the Swiss seem to know this), and when you have “accidentally” hooked a good pike, things become pretty exciting altogether. So, when the season for trout and salmon is over, when the winter almost knocks at the door, I’ll get my pike and perch gear out of the cupboard and fish the autumn blues away.